The Tigers have won their first four games this season, including Saturday’s 6-0 victory over Danbury, and they still haven’t allowed a goal. Ridgefield has outscored its first four opponents — Trinity Catholic, Stamford, Trumbull and Danbury — by a combined total of 20-0. Solid team defense has been a key to Ridgefield’s success. Perhaps even more remarkable than the four consecutive shutouts is the fact that the Tigers’ goalkeepers haven’t had to break much of a sweat. 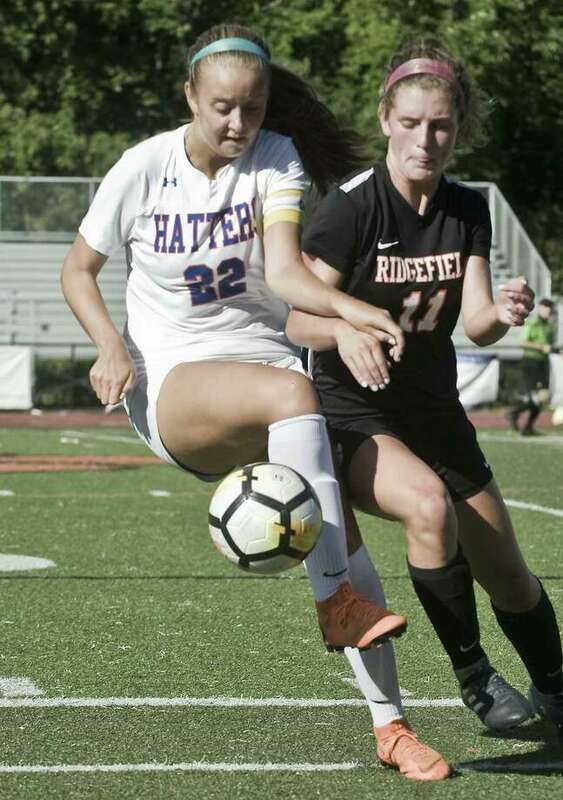 In Saturday’s win, Kelly Chittenden preserved the clean slate with one save as Ridgefield’s 10 field players combined to bottle up the Danbury attack and keep the Hatters pinned in their own end for long stretches. Six different players scored goals for Ridgefield on Saturday: Faith Arnold, Meredith Clifford and Julia Bragg all scored in the first half, and Grace Michalowski, Middlebrook and Caitlin Slaminko all scored in the second. Arnold assisted Middlebrook’s goal with a nifty corner kick. With a stout defense and such an assortment of weapons on offense, the Tigers appear tough to beat — just like in last year’s state tournament, when they won four straight games, including two shutouts, to win the title after falling short in the title game each of the previous two seasons. The Hatters, meanwhile, have lost four straight to start the season by a combined score of 17-2. they had a particularly tough schedule to start the season, as along with Class LL champ Ridgefield, Danbury has also faced Class LL and FCIAC runner-up Staples, Class L quarterfinalist New Canaan, and Fairfield Ludlowe, which was knocked out of the Class LL tournament in the second round by Staples. Such is life in the rough-and-tumble FCIAC. Goalkeepers Ty’Lynn Ith and Jenna Ferrandino stood their ground admirably in the face of nearly constant pressure. Ith made 11 saves in the first half and Ferrandino made three in the second half. The Hatters had their best scoring chance of the afternoon roughly halfway through the second half when Siara Pittman streaked down the right wing and uncorked a quick, low shot toward the near post. Chittenden dove to her left and corralled the shot to protect the shutout. Goals: Ridgefield: Faith Arnold, Ridgefield: Meredith Clifford; Ridgefield: Julia Bragg; Ridgefield: Grace Michalowski; Ridgefield: Claire Middlebrook (from Faith Arnold). Ridgefield: Caitlin Slaminko. Shots: Danbury 2, Ridgefield 24. Saves: Danbury: Ty’Lynn Ith 11, Jenna Ferrandino 3; Ridgefield: Kelly Chittenden 1.